PHNOM PENH - A truck hit an anti-tank mine in a former stronghold of Cambodia's ultra-communist Khmer Rouge guerrillas, killing at least five people and wounding three, police said on Sunday. The victims of Friday's accident in the northwestern district of Anlong Veng included women and children who were travelling in a truck carrying rice to a mill, police said. The area near the Thai border, was once a base for Khmer Rouge guerrillas and is where the group's chief, Pol Pot, died in 1998. Recent heavy rain could have loosened the soil and shifted the mine onto the road, provincial police chief Menn Ly said. 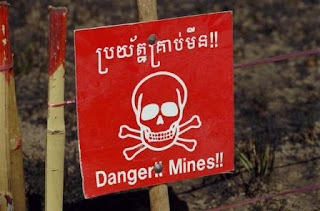 Decades of civil war, especially in the former battlefields of Khmer Rouge, left Cambodia as the world's most mined country -- an estimated 4-6 million landmines are believed to be still planted in the countryside. Mine-clearing teams have cleared over 400 square km (155 sq miles) of land but another 4,000 square km are still to be de-mined, said Leng Sochea, a spokesman for Cambodia's Mine Action Centre.